It was in 1973 that I gave up my chair as bassist for the aspiring Ray Charles tribute band Great Baye to farm up here in Plainfield. It will be 40 years this year that Anne and I have been married. Been forty years since I graduated from UNH with a degree in Environmental Science, finishing a fairly undistinguished and unremarkable academic career. It’s also been forty years since the town of Plainfield has had as much untimely and destructive weather as it has this year . After a sopping wet June of that year, the weather gods followed up with a storm on July 4th that dumped 4” of rain onto the already saturated earth. The result was flash flooding all about the town. 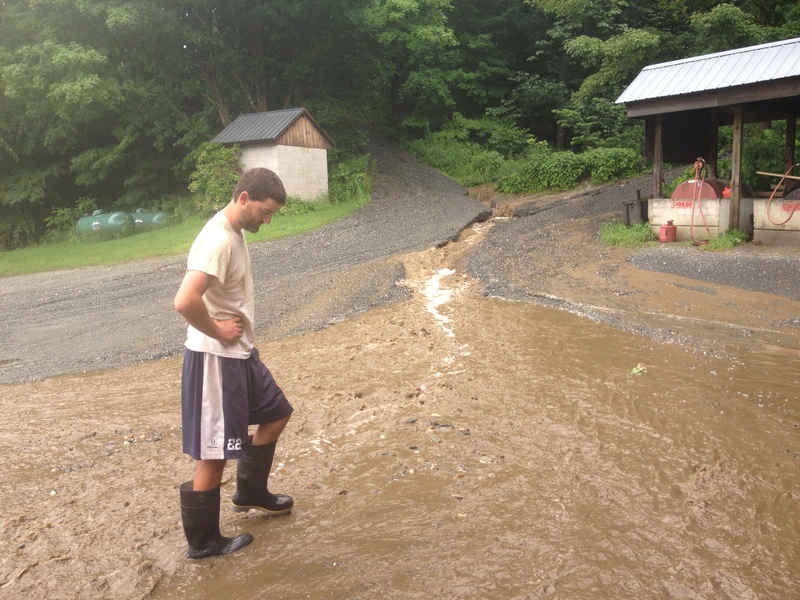 Families on our road were isolated for days, due to washouts of sections of the road as well as to a couple of well -placed mudslides on the lower end of the road. Anne and I were stranded that day, trying to retrieve some calves from a farm in West Claremont, only to come to a stop with the truck and trailer on the way home when the hole in the road turned out to be 40 feet deep. We spent the night at the house of a friend of the family in Plainfield Village and were not able to get home until the next afternoon. Fast forward to 2013. After planting corn with dust masks and living in what then appeared to be a developing dust bowl, we started to get rainy weather…..just about the time we started picking strawberries. It was helpful in the continuation of crop planting, but timely rain, not continuous rain, is really the order of the day during strawberry harvest. So we were doing a pretty good job of dealing with the crop for what we could pick and sell, but the PYO pickers couldn’t get into the field, or didn’t want to come out into the muggy, rizzly weather. Out of a potential 17 evenings that we were open for PYO, only twice did we stay open for our full hours of operation. We were either rained out, or the threat of lightning made us close the patch. The farm crew was doing an admirable job harvesting, and rot was minimal because we were getting just enough periods of drying and breeziness. 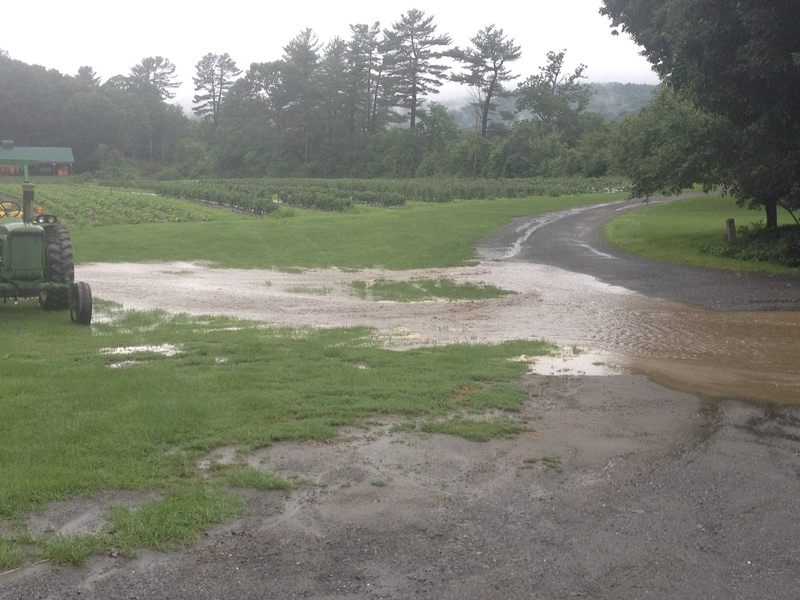 But on July 2nd it started raining in the afternoon – 2.5″ in 40 minutes. It washed out all our farm roads and just hammered the strawberries. During that night it rained another 3″, and just when the workers knelt down to try to sort through the mess and pick strawberries, the heavens opened up and dumped another inch of rain on them. The 2013 strawberry season was pretty much over .